Great Lagoon Views in this Spacious Villa! Book for Spring/Summer! This fantastic 2 bedroom villa is perfect for your next Hilton Head Island getaway. 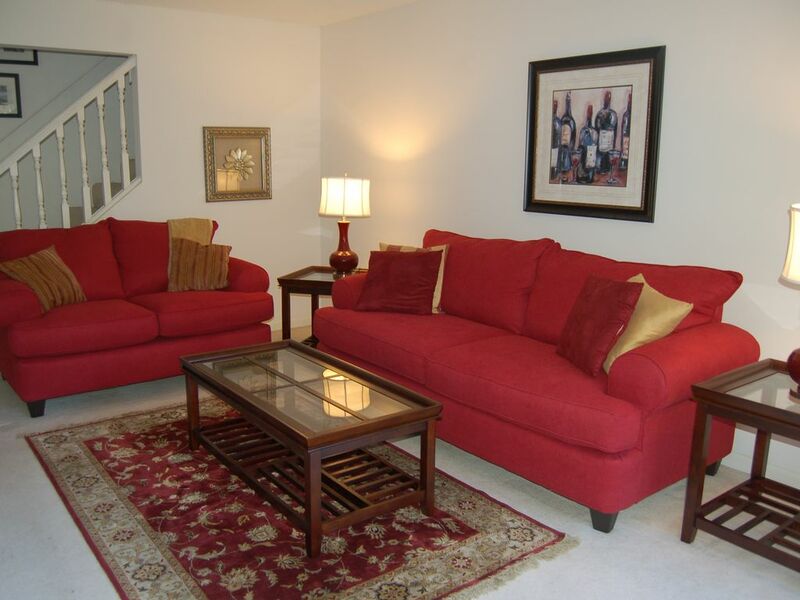 3359 Lake Forest Villa is a spacious townhouse end-unit (1500 sq. ft.) comfortably nestled in Sea Pines Plantation. Six steps lead to the entry. The first floor features a large living room with a sofa and loveseat, high definition flat screen tv, DVD player and stereo system. The kitchen is fully equipped for cooking and includes, among other things, a microwave, dishwasher, refrigerator and stove. There is also a table for 4. Off the kitchen is a dining room with seating for 6 as well as a wet bar fully stocked with glasses for entertaining. This level also has a bedroom that is furnished with two double beds and a flat screen TV with a full bath with access from the bedroom or hallway. The large master bedroom is located on the second floor and features a king bed, flat screen TV, private bath with tub and shower and beautiful views. The living room and dining room have access to a private deck overlooking the beautiful lake. With seating for 6, this is a perfect spot for relaxing and observing the Sea Pines wildlife. Tennis courts (complimentary) and pool are also on the site. This is the perfect place for a relaxing vacation whether it is with family or friends. Lake Forest Villas are conveniently located near the entrance to Sea Pines, adjacent to the 600 acre Forest Preserve and right on the bike path. Drive 5 minutes and you can be at the Sea Pines Beach Club where you will find a great beach, outdoor restaurant and beach store. This villa is just minutes from Harbour Town and South Beach. You are sure to have a wonderful vacation! Free shuttle service through Sea Pines Trolley available March through September. Parking at the Sea Pines Beach Club and Plantation Golf Club is $10 per day from Memorial Day weekend through Labor Day weekend. My husband and I bought this villa in 2008. We have family in Hilton Head and enjoy visiting with them. We liked this villa because it was spacious and very bright. We love the views of the lagoon and the wildlife. The villa is located close to the tennis courts and the pool. And, Lake Forest is conveniently located within Sea Pines not far from the Greenwood Drive gate. We are a short car or bike ride to Harbourtown and Sea Pines Beach Club. This villa is located a short drive from Sea Pines Beach Club where you can access the beach and ocean. The lagoon views from the villa are very peaceful. And, it provides viewing of wildlife. Located on first floor in closet in kitchen. Two bath towels, hand towel and wash cloth per person are provided. Sofa and love seat ... Very comfortable. Table for four in kitchen; dining room table seats 6. (3) Flat screen TVs in living room and both bedrooms. Wonderful views of the lagoon and Sea Pines Forest Preserve. Two tennis courts for use by guests at Lake Forest at NO CHARGE. They are just a few steps from the villa. A very short walk from the villa. Bike to Sea Pines Beach Club and go swimming. Or, to Harbour Town for shopping and eating. Clean, comfortable and excellent location. Glad you loved our second home! Come back and stay with us again! We stayed here during the Heritage golf tournament with another couple. We didn’t spend much time at the condo, but it was perfect for what we needed. The shuttle to get to the course was RIGHT across the street! Everything was clean and in order. The view of the lagoon on the back porch was great. My only wish was that there was an iron and ironing board onsite. Those spring clothes wrinkle! Luckily I brought mine from home just in case, but I think it would be helpful to have one there. I'm so glad you loved staying at our second home. I'm sorry you could not find the iron and ironing board. I know they were there when we were at the villa in early May. Sorry about that! This is the second time we have stayed here. The unit is comfortable and well supplied. Location is good in Sea Pines Plantation. Thanks so much for choosing to stay at my villa again! We love that guests come back to our villa for their vacations! We hope you will come back a third time! Second stay at this house. Rooms are large and bright with a great view of the lagoon. Would definetly stay again. This is our 2nd year staying at this condo and we always have a wonderful time. We saw nature right off the deck. Beautiful setting. Comfortable beds. Perfect for a family or couple. Very nice pool on grounds. Close to bike paths. We biked to beach, stables, lighthouse. Will stay here every chance we get to enjoy this beautiful island. We had a wonderful stay at Maureen's villa. Beautiful scenery, quiet, clean. I lost my Dad the Wednesday prior to my expected arrival, management and Maureen so easy to work with considering I needed a late arrival. Nearly canceled my trip for obvious reasons, but so glad I took advantage of the quiet time. We had a wonderful week, bike rentals made easy through Maureen's suggestion. Loved the upstairs skylight, comfortable bedding, kitchen well equipped. Great location near the forest preserve. We will be second time renters at this villa. No extra rental fees was a plus. I always leave things in good shape and feel I need no extra fee unless warranted. Maureen and Island Getaway made thus simple. Thanks so much, never needed it so much. Thanks so much for your wonderful review and glad you enjoyed your stay at my villa despite your recent loss of your father. Again, my sympathies . Tennis courts and pool located on the site. Villa is very spacious - 1,500 square feet. For rentals booked within 60 days of arrival date, payment in full will be due at time of booking. CAR PASS: If you have two cars, you will need two car passes. The current rate is $17/per car per week. The rate calulator includes one car pass. If you need a second pass please let me know so I can adjust your total cost and request the pass for you. During the summer rentals are from Saturday to Saturday. For stays less than a week departure cleaning is an additional cost. For stays less than or longer than a week, please contact the owner. The "instant quote" is not always accurate. Please contact the owner to obtain a firm quote. Thank you.